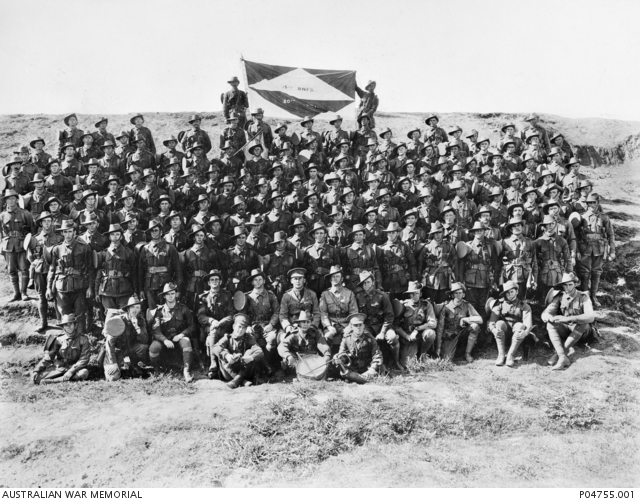 Group portrait of 15th Reinforcements, 20th Battalion at Liverpool Camp, NSW. The 15th Reinforcements embarked from Sydney aboard HMAT Euripides on 9 September 1916. Identified is 5641 Private (Pte) Albert Solomon, of Stanmore, NSW. Pte Solomon was a button badgemaker and was 18 years of age when he enlisted. This group includes the following soldiers who were subsequently killed in action, although their positions in the photograph are not known: Privates 5546 Bede Patrick Broderick (killed in action 9 October 1917); 5550 Edward Betts (killed in action 11 August 1918); 5576 Percy Flaherty (killed in action 3 October 1918); 5585 James Thomas Mudie (killed in action 2 May 1917 – see P07945.001); 5590 William Hicks (died of wounds 4 May 1917); 5593 Charles Bernard Hansen (died 3 December 1918); 5603 Claude Ferdinand Johnstone (killed in action 8 April 1918); 5607 Frank Lenon (killed in action 27 March 1917); 5608 Rufus Charles Lansdown (killed in action 25 March 1917); 5609 Edgar Murray Lane (killed in action 2 May 1917); 5613 Albert Ernest Manley (died of wounds 7 February 1917); 5618 John Dickson McCall (killed in action 25 March 1917); 5625 Erle Oakley Neaves (killed in action 6 November 1917); 5629 Benjamin John Peilow (killed in action 11 August 1918); 5631 Frederick William Paige (killed in action 10 October 1917); 5634 Arthur James Dein (died of wounds 12 March 1917); 5636 John Henry Robinson (killed in action 2 May 1917); 5643 Frederick Henry Searle (killed in action 31 August 1918); 5648 William Henry Siebert (killed in action 9 October 1917); 5650 Sidney James Stonestreet (killed in action 2 May 1917); 5659 Frederick Thomas Watson (killed in action 7 April 1918); 5667 Thomas Oliver (killed in action 20 September 1917); 5671 Arthur Williams (killed in action 3 May 1917); 5673 Norman Archibald Morris McMurtrie (killed in action 9 October 1917); 5681 Frank Horwood Johnson (killed in action 25 February 1917 – see P08624.069); 5684 William John Scully (killed in action 11 August 1918); and 5689 Robert Henry King (killed in action 28 October 1917). A full version of the Embarkation Rolls is available on the AWM website.